McMillen Jacobs Associates has been providing construction management (CM) services on major infrastructure projects since the 1980’s. This has included some of the largest and most challenging water, wastewater, transit, and highway projects in North America and Australia. 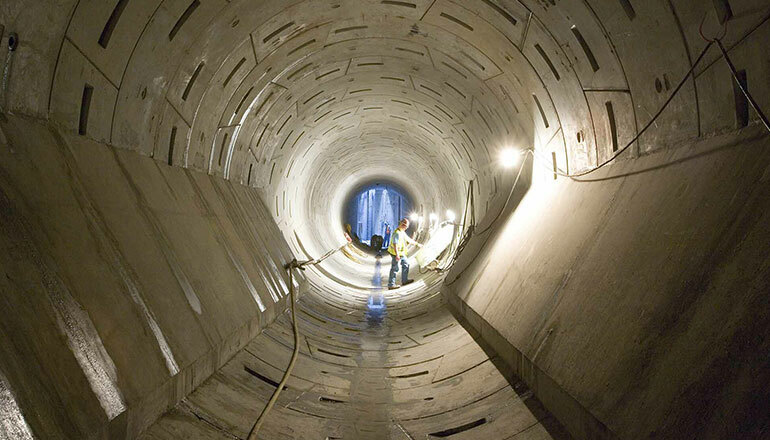 Today we are known as an industry leader in providing a full range of CM services for these markets with a special emphasis on tunnel, water resource, and complex infrastructure projects. We have accomplished this with our highly talented and experienced construction professionals known for a hands on, proactive approach in resolving field problems and delivering projects successfully. At McMillen Jacobs, construction management is treated as a unique practice where our field teams are required to have a specialized body of knowledge, skills, and experience. McMillen Jacobs regularly leads full service, multidisciplinary teams. We provide a full array of CM services that includes resident engineering, inspection and monitoring, project controls, scheduling, cost estimating, scheduling, change and claims management. Our construction management field teams are supported by an extensive resource pool of technical experts that cover every facet of water resources, tunnels, claims resolution, and most engineering disciplines. This is what makes McMillen Jacobs unique – clients get more than the on-the ground team, they also have access to an unmatched bench of specialists ready to help deliver their project. McMillen Jacobs is often asked to participate at the preconstruction phase of projects, an approach we prefer. Our preconstruction services include risk assessments, cost estimating, scheduling, constructability and biddability reviews, contract document reviews, recommendations on project delivery methods, and contract packaging. An example of the type of CM project that McMillen Jacobs can provide a full service construction management team on is the Blue Lake Hydroelectric Expansion for the City and Borough of Sitka, Alaska. Our integrated team of tunnel, dam, and hydropower professionals provided management and coordination of critical construction activities on dam and powerhouse foundation excavations, 3 tunnels, installation of new penstock, and a new 3-unit powerhouse. We have extensive CM capabilities to help deliver a wide range of water resource projects. We can field teams that have technical expertise and hands on construction experience on fisheries, fish passages, pipelines, dams, inlet and outlet structures, gates, and powerhouses. Because we design and build these facilities, our CM teams are supported by technical professionals that cover every discipline including civil, structural, mechanical, electrical, geotechnical, environmental, and licensing. In the past 15 years, McMillen Jacobs has provided CM services for more than 40 tunnel projects throughout Northern America and Australasia. These projects include a CSO (Combined Sewer Overflow) project in Providence, Rhode Island, with 3 miles of 30 ft diameter bored rock tunnel, nearly three miles of trenchless pipe installation in soils, and a gymnasium-sized underground rock cavern that houses a pump station. We currently provide a range of inspection and construction management services on transit projects including OLRT in Ottawa, East Link in Seattle, and Central Subway in San Francisco. McMillen Jacobs has a CM team participating on the Alaska Way Viaduct, where the largest tunnel boring machine in the world is being used to construct a new highway beneath downtown Seattle. We provide construction management on trenchless projects and have several underway now in LA and NYC. We recently completed the Bi-County Water Tunnel, a five-mile-long drinking water conveyance tunnel in Maryland. Collectively, these projects have included virtually every type of ground improvement, ground support, ground modification available, along with all excavation methods in rock and soil including TBM and SEM.